A new florist shop based at our Chamberlain Business Centre in Hull was officially opened by the Lord Mayor of Hull this week. The Lord Mayor of Hull made her first official appointment to open a new business at our Chamberlain Business Centre in the city this week. Councillor Mary Glew was inaugurated at the weekend, in what is the centenary year of the post of Lord Mayor in Hull. On Tuesday she visited Drury Lane Flowers, which has recently moved into The Gatehouse unit at our business park. 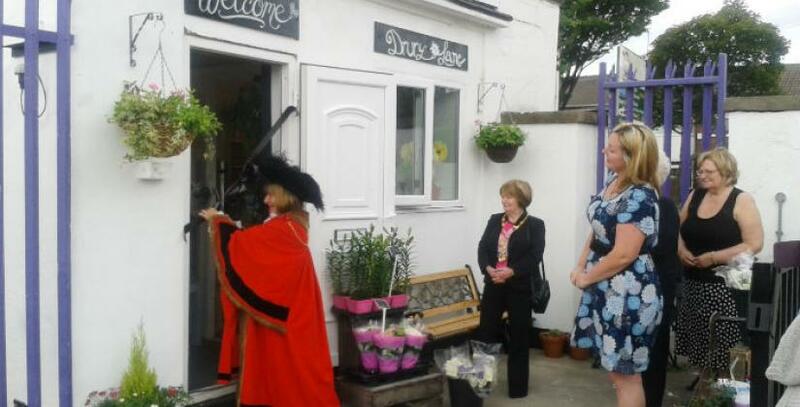 Business owner Sallyann Drury invited the Lord Mayor to officially open her new shop as the councillor had previously attended Sallyann’s flower arranging workshops. “I am delighted she was able to accept my invitation as it was a fantastic way to launch the new business unit, particularly as the Lord Mayor has an interest in flowers herself,” Sallyann says. Sallyann launched Drury Lane Flowers five years ago, as she wanted a change from her career in training when she had her daughter. Having always had an artistic flair, Sallyann decided to do a BA degree in Floristry Art and Design at Bishop Burton College as a mature student, aged 26. “I really enjoyed it, although it was hard work at times, especially as I had a part time job as well,” says Sallyann. Our Chamberlain Business Centre offers a variety of business space for rent, including storage units and facilities, offices, workshops, industrial units, mailboxes and meeting rooms. Contact Business Centre Manager Gillian Stockdale with enquiries, on 01482 214 770.